Facehuggers unleashed in new Alien: Covenant movie clip! [Beware Spoilers] 20th Century Fox have released a new Alien: Covenant movie clip titled My Face. 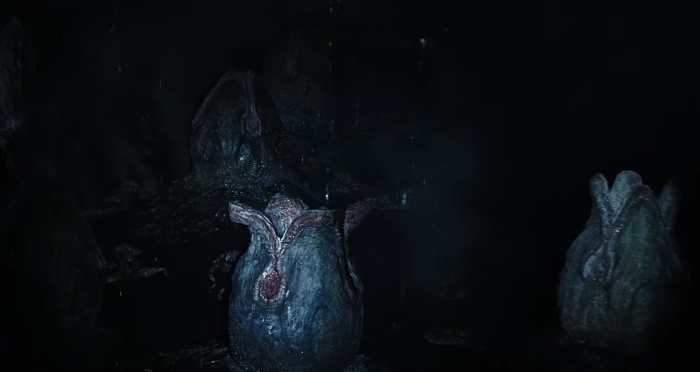 The clip involves the discovery of David's hidden repository of Alien eggs, along with an agile Facehugger who surprises the unsuspecting crew who ventured into its surroundings. The Facehuggers in Alien: Covenant are one of the film's best creatures - they are portrayed in such a raw, aggressive and powerful way, we've never really seen the Facehugger portrayed this way before - and it's magnificent. Hats off to Odd Studio and Creatures Inc. for their phenomenal work on the practical effects Facehuggers and more! If you don't mind some mild spoilers, check out the clip below and let us know what you think in the comments section! 7 Fan responses to Facehuggers unleashed in new Alien: Covenant movie clip! This film looks amazing. I hope everyone enjoys it for what it is before dissecting it with the indepth alien analysis stuff. Wow! The Facehuggers are probably the scariest creatures in any Si-Fi movie! They're super fast and erratic, like absolutely lethal spiders on steroids! And when they get to you, you're done for, that's it, goodbye! If there is more than one face hugger, then should there be more than one xeno? That certainly would seem to be the case, Movie fan! A second Xeno? Why I get the feeling that this 2nd "Xeno" is important? Or do they just kill the first (cargo lifter) and the second gets/is born on the covenant? Nasty, fast, frenetic...they did a great job on them!